Horseback riding is something truly amazing that one must experience to truly understand. There is something special about communicating with your horse and creating that bond together. Riding a horse is peaceful and relaxing. There are no loud engine noises, smells of exhaust fumes and damaging aftermath of riding an ATV. Lake George is a destination location for horseback riding; its home to hundreds of miles of trails and numerous stables. Since Lake George is nestled right on the edge of the Adirondack Mountains you literally have more trails than you’ll ever be able to ride in a lifetime. Before you get started there are a fun things to keep in mind before you saddle up. Know your limits: If you’re riding an unfamiliar horse or perhaps a more treacherous terrain make sure you feel comfortable, confident, and in control of your ride at all times. If you have any doubts or trepidation then err on the side of caution and dismount. This is always better than falling or getting bucked off. Wear the proper safety gear: No matter your skill level you should always prepare for the worst and be ready for anything. Even if you’re an expert rider and familiar with your horse doesn’t mean that accidents can’t happen. The horse could get spooked or you could be close lined by a low hanging branch, the point is you just don’t know. All riders should wear a helmet at all times. Having proper footwear is also important. Wearing the right type of footwear will help you grip the stirrups and communicate the commands to the horse more efficiently. 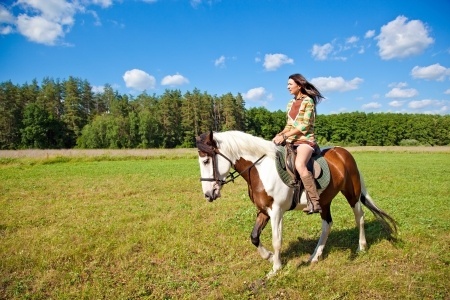 Always get back on the horse: Now that you’re wearing the right safety gear you should ways follow this rule. If you do fall off the horse you can’t be afraid to get back on, which leads me to number 4. Take charge: Be sure you are confident and you take control of your horse, but don’t be a complete dictator. Be sure that you communicate consistently and clearly with your horse. If you’re able to do this your horse will be happier and more likely to listen to you. Following these easy tips should ensure that you have a fun and successful outing with our horse and return safe and in one piece. Be sure to always ride with an experienced rider who can continue to give you tips and feedback on how you’re doing.